Yes, I do this periodically. I find something new and shiny and obsess. Unlike other people’s obsessions, though, mine are almost always craft or art related. I have to learn and I have to do until I have somewhat mastered it. Sometimes, not always, but often, it’s about the learning. Learning facts and processes are nice, but learning to do – that’s what floats my boat! 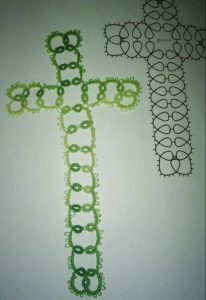 I have added a tatting page and will be adding resources there periodically. I’m not planning to turn this into a tatting website. We’ll have to see how far my obsession goes before I start considering that.